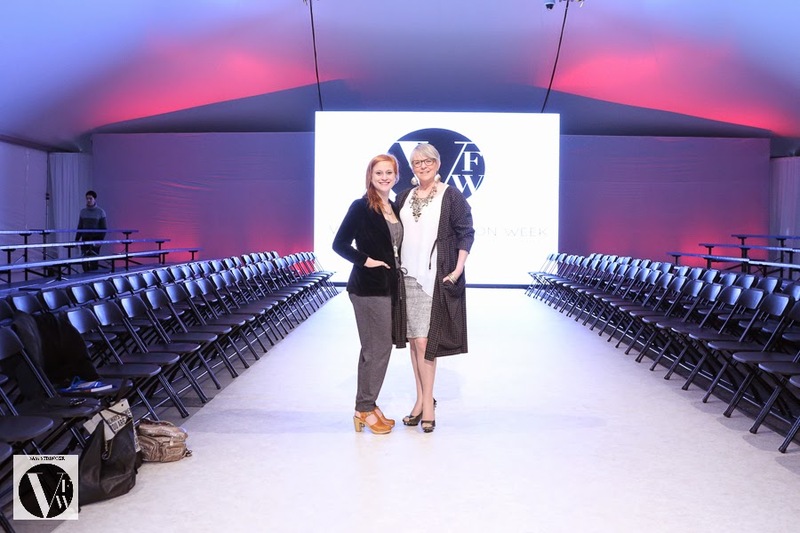 Day two of runway shows at Vancouver Fashion Week (VFW) found me in the venue early helping jewelry artist Paloma Sanchez. She was there working with the technical staff on lighting for her Thursday show. As I was wearing a large Carolyn Bruce necklace with sparkle and not busy at the moment - I found myself walking back and forth on the runway as they experimented with different ideas. By the time the doors were open, my feet were already tired. A side a note here to Connally McDougall - Where did you disappear to? You were going to sit next to me and then by the time the doors open you had vanished never to be seen the rest of the evening! I missed you. Hopefully not an alien abduction! Each season is subtly different. F/W 15 has a more relaxed, softer feel. While that is lovely when you are there for the whole evening, it also means you forget sometimes to jump up and snap those all important photo ops between shows. Yesterday was one of those days for me. I totally missed getting my little instamatic out and capturing a few candid moments. Thankfully there were photographers there to fill in the blanks. I love supporting local, so yesterday chose to wear a woven skirt with side split by RozeMerie Cuevas of JAC, a long fabulous coat by Sara Armstrong who was the closing show this evening and a stunning necklace by my friend/artist Carolyn Bruce. All live in Vancouver, all are easily found on Facebook and all are ready to help you look fabulous. I have a growing shoe addiction and was in love with my new, crazy shoes last night, but forgot to take a closeup. So here is a pic from the internet. The line-up this evening was again wonderful. As always - I only cover four because of time, but really want to encourage you to check out the other designers. Maark Abenir of Averynthe presented a great feminine collection with some truly daring silhouettes including a back that plunged to new depths. 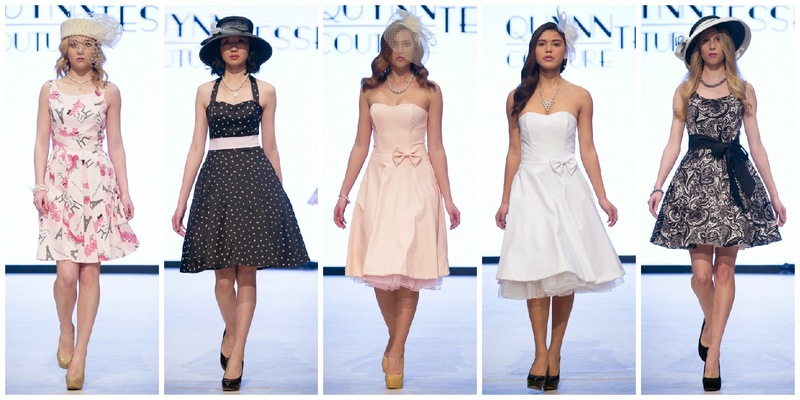 Kate Mills of Kate's Couture - only 15 years of age - offered a imaginative selection of silhouettes that shows promise of a very bright future in the industry. Where did she learn her skills? From her grandmother! Also on the runway was Atira, Dervish Dubai (brand new label) and AtoZ Clothing! 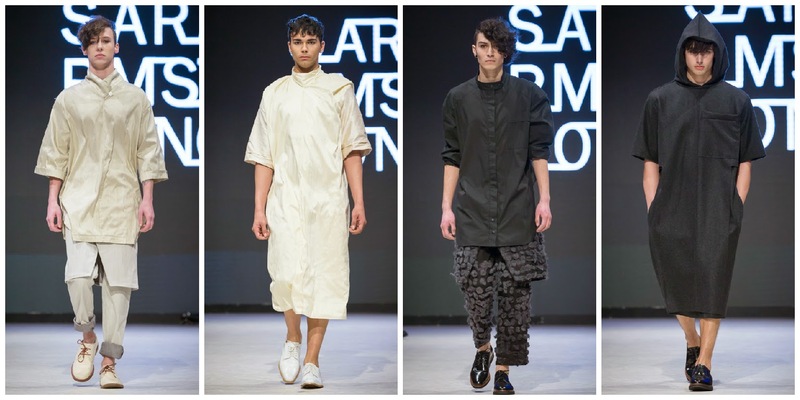 The four chosen today offer a range of aesthetics to give you an idea of the variety we are seeing each day on the runway - Lasalle College (covered in a separate article-to read click HERE), Quynntessential Couture, ENCIMA and Sara Armstrong. Designer Quynn was making clothes for her teddy bears and dolls by age 5 and by age 16 was creating her own prom dress - actually teaching herself the skills needed while sitting at the machine working on the dress. Later she explored costume design - creating unique, one-of-a-kind pieces. The next step came easily - the decision to turn her hobby into a career. Every dress created is custom made by hand in-studio to the highest standards. 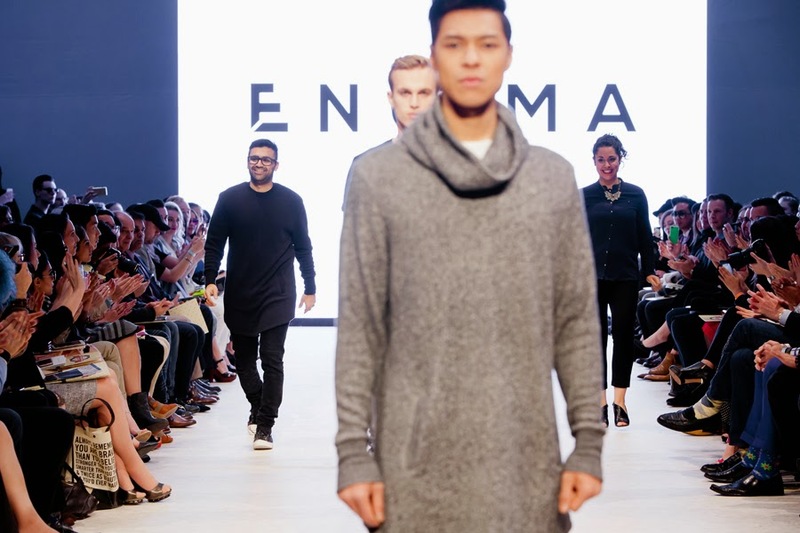 Encima brought the comfortable, cozy wear we all love to don on one of those cool fall West Coast days. The label is the creation of husband/wife duo – Faiz and Suzy Lalani. How fabulous it is a local label - both in design and in manufacturing. 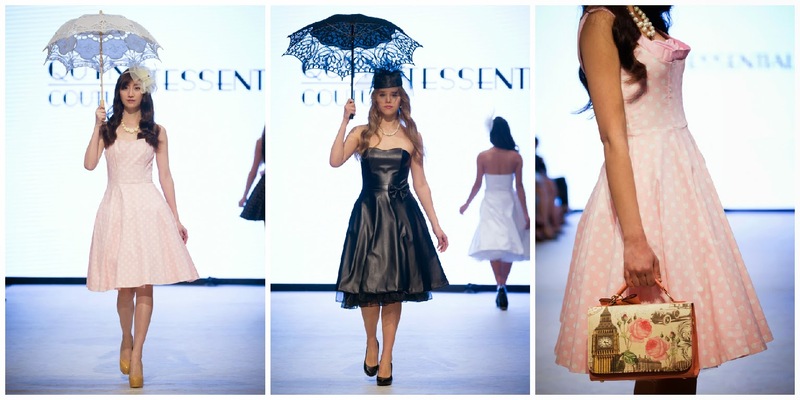 Supporting the Vancouver industry and ensuring the garments are made ethically is important to these designers. From their bio, "Whether it is the slight details or the unconventional designs, each piece in ENCIMA’s growing collection is created to inspire people to make a statement with the clothing they wear. The idea behind Encima is to create pieces that truly reflect individuality. Faiz’s philosophy and inspiration is that we are all different in the way we look and act, so we should express our true-self in how we dress." I loved the textures, relaxed fit and neutral palette. One unique feature I'm not sure about is shirts that are longer in front and shorter in back, but my friend/singer Warren Dean Flandez was in awe and loved this detail. So much so he had to meet the designers personally to find out where their line was sold. And that's what fashion is all about. This is one talented young designer who continues to push herself to grow with every new collection. Here is an excerpt from her bio, "Sara Armstrong is an interdisciplinary artist who practices in both industrial and fashion design. 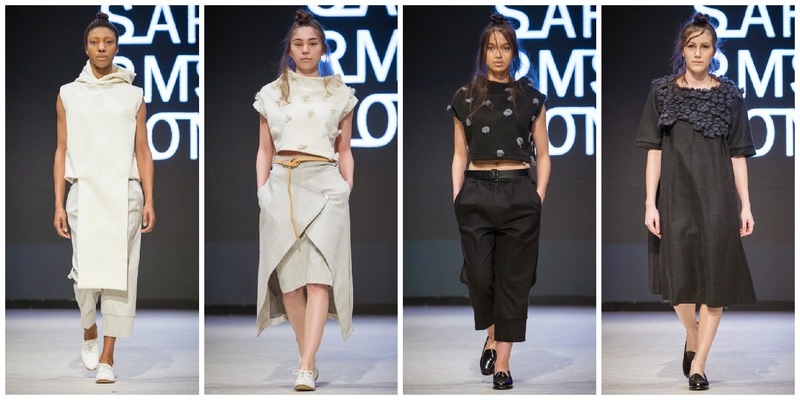 [She] creates ready to wear pieces with an androgynous blur...With a focus on architecturally inspired urban luxury, Sara’s formal training in sculpture is immediately apparent in pieces that balance complex geometries with pared-down simplicity. Lucid yet intuitive,"
Last season I was impressed with her collection - simple designs, strong silhouettes with impeccable tailoring, This season offered the same, but with obvious growth as a designer. The sculptural nature of her work always stands out. But as someone who sewed professionally, the detailing always catches my eye. Every seam is almost invisible, every pocket lays perfectly flat to the garment. Getting an added pocket to lay so flat it looks embedded in the garment or a seam to almost disappear is not easy and a sign true craftsmanship. I also loved the androgenous element and the simple palette that let the designs clearly shine. Sara - come back next season. I will be waiting. For tix or schedule information on the rest of the shows go to www.vanfashionweek.com.